Angels gather here. From Mum's grave. I am hiding, as you all know. My mother died on the 4 September, and I decided to halt everything, postpone everything, cancel everything, and hide. Here is an update from under the duvet. I am trying to hide. Life does not come to a halt just because I want to stop taking part, and I have found that the decision to go to ground is more complex than simply not getting out of bed. What is it that I am wanting to stop doing, then, that I was doing before Mum died? That, oh that, is the question. Within the decision to hide are the questions - what am I hiding from? And why? We shall think about this below. I am not really under the duvet. In my new bedroom in the front sitting room of my house, next to the piano and the grandfather clock, there is an old white chair that rocks when you sit on it. It isn't a conventional rocking chair, though it acts as one. Covering the chair is a pink and white polka dot blanket, and over the blanket is a teacloth on which are printed spotty and stripy teacups. Just where it most comfortable and effective when one sits down, is a purple cushion with extraordinarily large purple ruffles sewn onto the fabric. On the floor to the left of the chair is a giant strawberry coloured blanket from the Avoca woollen mills in Dublin, and on the floor to the right is a big, dark pink, soft and fragrant shawl. This is my hiding place. I sit in this chair and decide which of my blankets I wish to wrap up in, and as the chair is in the corner of the room, I feel I am truly tucked away. I have some pixie type slippers in green felt, with pom poms on them, from my son in law, and with these slippers on my feet, either or both of my blankets wrapped around me, I feel suitably invisible to the outside world on my chair that may or may not be a rocking chair. Next to the Hiding Chair is a small table. That is where I put my tray of tea. On the other side of the Hiding Chair is the piano. That is where I line up my pens, paper, books and I balance my laptop. The door handle on the outside of the door has fallen off, and so I can get out if the door is closed, but no one can get in. I am delighted with this and think I have discovered the key to the secret of my own survival. Not really. I aim to, but life will not stop. I am looking for space to process my mother's death. I cannot do it while talking, or listening, or being with other people. The idea of being utterly still and silent feels like the only way to achieve this, but I am not able to do stillness nor silence for long because it is not in my nature to be so. My two sons have been very ill recently, I cannot ignore that. My daughter and her husband have their first child in a few weeks time, I cannot ignore that. My father has dementia, my brothers and I cannot ignore that. In fact, I have become my father's carer part time. I can't do that from my pretend rocking chair behind the piano. I have to get in the car and drive to London and back, which is a good long way away from Bognor Regis. Every room in my house is rented out. I have four image conscious, body building, pizza eating young men with fabulous hair styles in their late teens and early twenties living here, plus two exotic, well made up and ambitious young women also in their early twenties. The young fellows have uncomplicated ambitions. To have six packs, to meet girls, and to have jobs that pay them lots and lots per hour. One of the gorgeously made up young women of the household is the girlfriend of one of the young men here, the one whose hair is more black, more sculpted and more unyielding than any of the others. They both rent my annex, and live a sort of semi domestic life, except that neither of them like cleaning, or cooking, or tidying, or laundry. They like each other though, and pizza, and so far, that is enough for them. The house is always full. The lodgers that live here are glorious, uncomplicated, messy and full of life. They make me smile, I try and keep order (they are very well meaning) and we all rub along very nicely indeed. They cannot be ignored. Even if I wanted to, I could not pretend they are not here and hide away to think my thoughts for very long. None of my household can see beer bottles when they are empty (not because they are drunk, but because the beer bottles are no longer interesting without beer in them and so become invisible). They can't see pizza boxes either when they are empty, and the putting on of laundry in the washing machine is more than enough housework for the time being. It can, and does, stay in there after the cycle has finished, until it dries in a muddle and smells awful. Washing up means putting some things in the dishwasher, and the rest in the sink in old water, because they lose interest and feel that if half of their stuff is in the dishwasher, then that is as good as all of it. The spoons and cups and plates in the sink become, like the beer bottles and pizza boxes, invisible, and off they go to have another cigarette in the garden and to plan the next bout of training with weights and dramatic haircuts. My lodgers are full of goodness. They help me in with heavy shopping. They ask how I am, they tell me their plans. They mow the grass and they try very hard to not have parties when I am not here. They are funny, kind, young and all of them work hard. They pay all their bills on time, they never complain and I love having them around. Hiding from them is necessary, even without Mum dying, but it's good to know that when I get off my pseudo rocking chair, and leave my room and encounter them in the house, that all the important things in their lives are still as gripping as ever. (Girls, six packs, pizza and money). Work that went on hold when I moved in to look after Mum is now due for completion. I am doing that, and it gets me into the studio. The studio worried me. I thought, because I need to stop everything, that I don't know what to paint or create any more, and perhaps all of that has gone. It hasn't gone, it is on hold, and when I get perspective, which I do more often than I don't, perhaps something will come out in a painting. I am content with that for now. What has been postponed is seeing my friends. Talking on the phone. Going out and doing things. I have put all work on hold that takes me out from the house or studio. I don't have very much to say, and I am not able to articulate what is in my mind and heart, because I don't really know. I am not grieving. I am bereaved, but not grieving in the same way as for Steve. I am sad, I am quiet, I miss my mother but I am also feeling released and relieved. I loved my mother, but she was difficult and I spent most of my life trying to get away from her. My mother was powerful, clever, loving and kind. She also suffered from terrible depression, and was manipulative, judgemental, cruel and angry. Much of her anger was directed at me. It was difficult to find a way to be with her, and difficult for her to find a way to be with me, but we did find a way, and I loved her, and I know that she suffered terribly. But she could be toxic. Our last six weeks together healed us both. There was no need to fight any more, no reason to hold back, and what was left after the struggle was no longer a struggle was a depth of wisdom, love, kindness and strength. The last six weeks of Mum's life saw what was true about her, what was always present at her core; her extraordinary wisdom and insight. Her power and her ability to love without boundaries stopped fighting with her demons, her darkness and her need to destroy. Her remarkable intelligence was no longer masked by her denial of it, and everything that was good about her shone in her final weeks. She could love me and accept me for who I was, and I could love her and accept her for who she was. She gave me the chance to really see her, and she showed me healing and went out of this life as the best and truest version of herself that she could be. So I am hiding, and asking myself who I am now. I will be a grandmother next month. My difficult and beautiful mother allowed me to help her die. I am no longer judged, and I was truly loved at the end. So what and who am I now. What has my mother taught me? What do I want to do? Who am I now? When my first child was born, my mother bought me a red arm chair in which to sit and feed the baby. I remember deciding to sit in that armchair for six weeks because I didn't know what to do, and I needed to be alone with the baby. Six weeks passed, and I decided that it wasn't enough, and that what I needed to do was to stay in the chair in my pyjamas with the baby, indefinitely. I stayed there for three months. This is what I am doing now. I am in another chair, and I am often in my pyjamas, and at the moment, I feel this is where I will be for at least three months. I am holding my mother's memory, and thinking about what her life was like. It is making me think that my own life needs to be much more simple. Sitting in my Hiding Chair I am letting myself stop being busy all the time, I am letting myself day dream, I am asking myself do I really want to do all the things that I was doing before? Do I really want to do all those things? There isn't really a conclusion today. Just an ongoing process. I will be sitting here for some time, letting it all hang out, so to speak. Mother, like Elvis, has left the building and I am coming to terms with what that means. 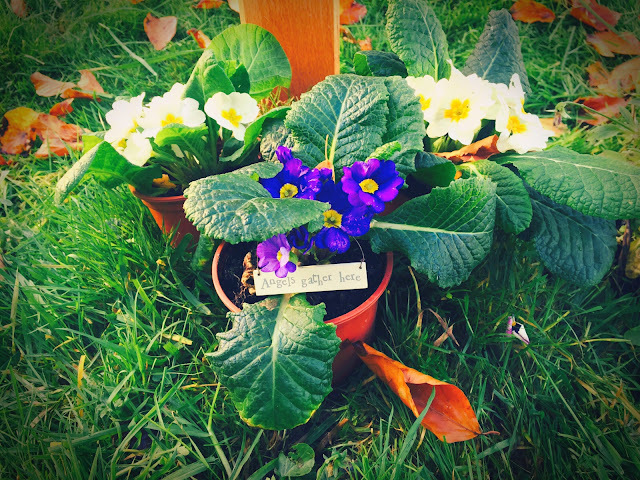 Planting to mark the spot where Mum secretly buried her sister Kit's ashes, to make sure they went into consecrated ground. Mum is buried just over the car park on the other side, amongst the new plots. She and Kit are together again but one is legit, and the other is not.